Emma Morano (1899–2017), was the oldest Italian ever recorded, and the oldest person in the world for about a year. Pictured in 1930, aged 30–31. Italian supercentenarians are citizens, residents or emigrants from Italy who have attained or surpassed 110 years of age. As of January 2015[update], the Gerontology Research Group (GRG) had validated the longevity claims of 151 Italian supercentenarians. There are currently about 14 Italians alive over age 110; the oldest one is Maria Giuseppa Robucci, born 20 March 1903, aged 116 years, 37 days. Robucci is also the oldest person alive in Europe. The oldest Italian ever was Emma Morano, who was also the last person in the world to have been born before the year 1900. She died on 15 April 2017, aged 117 years and 137 days. Unranked entries have not yet been validated by the GRG. Rosalinda Del Duca[d] F 14 May 1875 3 May 1986 7004405310000000000♠110 years, 354 days ? ? Antonio Todde (22 January 1889 – 3 January 2002) was an Italian supercentenarian who, at the time of his death, was the oldest man in the world. Todde was born in the village of Tiana, in the province of Nuoro, Sardinia, an area noted for its centenarian density. Born to a poor shepherd family in the medieval center of Tiana, Todde was the third of 12 children. In 1920, he married Maria Antonia, then aged 25, and they had four daughters and a son. She died in 1990, aged 95. He left Sardinia only to fight in the First World War, where he was injured in the shoulder by a grenade. He died at age 112 years, 346 days on 3 January 2002. Venere Pizzinato (married Papo, 23 November 1896 – 2 August 2011) was an Italian supercentenarian, living to the age of 114 years, 252 days. At the time of her death she was the oldest person ever from Italy, a title she held until 13 December 2011 when she was surpassed by Dina Manfredini. She was the world's third oldest living person, behind Besse Cooper and Chiyono Hasegawa. Pizzinato was also the oldest person ever to have been born in the Austro-Hungarian empire. She was the oldest person ever to be born and die in Italy, until being surpassed by Emma Morano on 9 August 2014. She was born in Ala, Trentino, then part of the Austro-Hungarian empire, on 23 November 1896. In 1902 the family moved to Verona, where they had relatives. In 1903, the family moved back to Trentino, where Pizzinato attended a boarding school in its capital city, Trento. World War I forced Pizzinato to take refuge in Bazzano, Bologna. After the war, she moved back to Milan where she took Italian citizenship and met her future husband Isidoro Papo. During the outbreak of World War II, in 1939, the couple moved to Nice, France, to escape the Fascist regime of Benito Mussolini. They married in France, and after the war, they moved back to Milan. Upon retirement in 1964, the couple moved to Verona, where they finally settled. Mr. Papo died in 1981. The couple never had any children. Pizzinato remained in Verona for the rest of her life; at the time of her death, she lived in a retirement home there. On 23 November 2010, marking her 114th birthday, Pizzinato was visited by Italy's president, Giorgio Napolitano, who wrote her a letter with the words "In this happy and special occasion I would like to send, on behalf of all Italians, sincere congratulations and good wishes of serenity with her loved ones and people around the community Saint Catherine in Verona". Marie-Josephine Clarice Gaudette (25 March 1902 – 13 July 2017) was the oldest living person in Italy from the death of Emma Morano, who was the oldest living person in the world and the oldest Italian person ever on 15 April 2017 until her own death three months later. Gaudette was born in Manchester, New Hampshire, United States, and was the oldest living person born in the US from the death of Susannah Mushatt Jones on 12 May 2016 and the oldest emigrant from the US ever. A nun known as Mother Cecilia, she lived in the Italian convent from 1958 until her death and was considered "the world's oldest nun". She lived in Canada and France before settling in Italy. Gaudette died on 13 July 2017, aged 115 years, 110 days, as the 5th-oldest living person in the world. Giuseppina Projetto (30 May 1902 – 6 July 2018) was, at age 116 years, 37 days, the oldest living person in Italy from the death of Marie Josephine Gaudette on 13 July 2017, and the world's second-oldest verified living person behind Chiyo Miyako upon the death of Nabi Tajima on 21 April 2018, until her own death on 6 July 2018. She was born in La Maddalena, but was of Sicilian origin. Her maternal grandfather had moved from Sicily with the expedition of Giuseppe Garibaldi. In 1946, she married Giuseppe Frau, a widower with three children. At the time of her death, Projetto lived in Tuscany with her daughter-in-law and grandchildren. Projetto had been the oldest living person born in Italy since the death of Emma Morano on 15 April 2017, as Gaudette was born in the US. Projetto is the second-longest-lived Italian person ever behind Emma Morano, and was also the oldest living European from the death of Ana María Vela Rubio on 15 December 2017 until her own death. ^ Pizzinato was born in Ala, which was then part of Austria-Hungary. It is now in Italy. ^ Mattivi was born in Trento, Trentino, which was then part of Austria-Hungary. It is now in Italy. ^ Staffler was born in Ulten, which was then part of Austria-Hungary. It is now in Italy. ^ Status unclear: GRG tables published later than 2007 do not include this person. ^ Slovenia was then part of the Austria-Hungary empire. ^ Nicolli was born in Stenico, Trentino, which was then part of Austria-Hungary. It is now in Italy. ^ a b c d e f g h i j k l m n o Wikkerink, Marco; Kroczek, Waclaw Jan (1 January 2015). "GRG Database by Nation". Gerontology Research Group. Retrieved 8 November 2018. ^ a b c d e f g h i j k l m n o p q r s t u v w x y z Epstein, Louis; Young, Robert; Adams, Johnny; Muir, Mark (7 December 2018). "GRG World Supercentenarian Rankings List". Gerontology Research Group. Retrieved 9 December 2018. ^ Diebel, Matthew (13 May 2016). "This woman is the only person left born in the 1800s". USA Today. Retrieved 8 November 2018. ^ a b c d e "Deaths for 2012 (in Chronological Order)". GRG. 4 November 2014. Retrieved 9 December 2018. ^ a b c d e f g h i j "Deaths for 2011 (in Chronological Order)". GRG. 17 November 2014. Retrieved 9 December 2018. ^ a b c d e "Deaths for 2005 (in Chronological Order)". GRG. 7 March 2013. Retrieved 9 December 2018. ^ "Genova, è morta la nonnina d'Europa: aveva 114 anni" [In Genova, Europe's grandma died: she was 114]. Il Piave (in Italian). 29 December 2005. Archived from the original on 29 September 2011. Retrieved 19 December 2011. ^ a b c d e f g h i j k l m n o p q r s t u v w x y z aa ab "Verified supercentenarian cases – Italy". GRG. 24 March 2007. Retrieved 9 December 2018. ^ a b c d e f "Deaths for 2009 (in Chronological Order)". GRG. 3 December 2014. Retrieved 9 December 2018. ^ "Guerina Amedei festeggia i 113 anni, è la quarta più longeva in Italia" [Guerina Amedei celebrates her 113th birthday, she is the fourth oldest person in Italy]. RomagnaUno (in Italian). 31 January 2019. Retrieved 18 February 2019. ^ a b c "Deaths for 2006 (in Chronological Order)". GRG. 30 September 2014. Retrieved 9 December 2018. ^ Rhone, Albert. "Luisa Chiacchiari". Painesville Italians. Retrieved 9 December 2018. ^ Hutchison, John Arthur (30 June 1999). 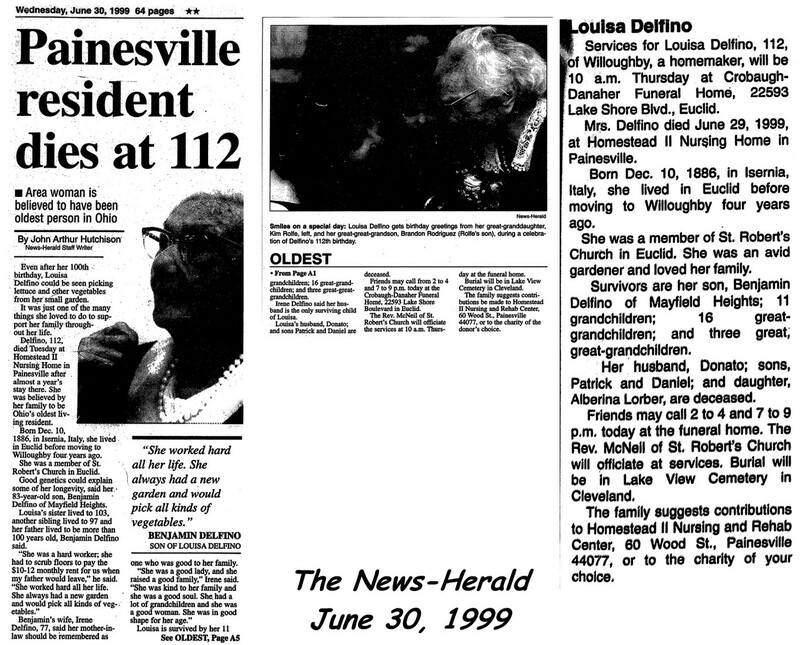 "Painesville resident dies at 112". The News-Herald. Retrieved 9 December 2018. ^ a b c d e "Deaths for 2007 (in Chronological Order)". GRG. 24 September 2014. Retrieved 9 December 2018. ^ "Muore a 112 anni la più anziana tra le donne pavesi - Cronaca - La Provincia Pavese". gelocal.it (in Italian). 4 August 2017. Retrieved 24 August 2017. ^ "Valesca ha spento 111 candeline: è la più anziana della Toscana" [Valesca has blown 111 candles: she is the oldest person in Tuscany]. la Repubblica (in Italian). 9 July 2018. Retrieved 27 November 2018. ^ a b c "Deaths for 2008 (in Chronological Order)". GRG. 1 July 2013. Archived from the original on 5 July 2015. Retrieved 9 December 2018. ^ Cherubini, Massimo (23 September 2018). "Irma, la super-nonnina ha festeggiato 111 anni. "E' ancora lucida e forte"" [Irma, the super-grandma, has celebrated her 111th birthday. "She is still lucid and strong"]. La Nazione (in Italian). Retrieved 27 November 2018. ^ "Addio Maria Antonia: a 111 anni era la donna più longeva di Calabria" [Farewell Maria Antonia: at 111 she was the oldest woman in Calabria]. il Quotidiano del Sud [it] (in Italian). 19 October 2016. Retrieved 18 February 2019 – via Riviera Web. ^ "Addio alla nonnina record dei mantovani". Gazzetta di Mantova. 22 August 2018. Retrieved 5 December 2018. ^ "Si è spenta a 111 anni la mamma del capogruppo onorario degli alpini di Limone Piemonte" [The mother of the Limone Piemonte alpinists' honorary group leader passed away at 111]. TargatoCn (in Italian). 27 June 2016. Retrieved 18 February 2019. ^ "Addio a Maria Teresa, 111 anni, supernonna della Liguria" [Farewell to Maria Teresa, 111, Liguria's supergrandmother]. Il Secolo XIX (in Italian). 15 November 2016. Retrieved 18 February 2019. ^ a b "Deaths for 2010 (in Chronological Order)". GRG. 18 September 2014. Retrieved 9 December 2018. ^ Suggi, Francesca (22 December 2016). "Lidia Riso, con i suoi 111 anni è la nonna di Toscana" [Lidia Riso, with her 111 years, is Toscana's grandmother]. Il Tirreno (in Italian). Retrieved 18 February 2019. ^ "Addio alla nonna di Livorno (Lidia 111 anni). Nogarin: con Lei se ne va una parte della nostra storia" [Farewell to Livorno's grandmother (Lidia, 111). Nogarin: with her a part of our story is gone.] (in Italian). 11 February 2017. Retrieved 18 February 2019. ^ "Leonessa, Maria Federici festeggia il traguardo dei 110 anni" [In Leonessa, Maria Federici celebrates the 110-year milestone]. Il Messaggero (in Italian). 4 April 2018. Retrieved 18 February 2019. ^ Fiori, Roberto (24 April 2018). "I 110 anni di Erminia, la donna più anziana del Piemonte" [The 110 years of Erminia, the oldest woman in Piedmont]. La Stampa (in Italian). Retrieved 18 February 2019. ^ a b "Validated Supercentenarian Cases (Public List)". GRG. 13 August 2007. Retrieved 9 December 2018. ^ L. C. (23 May 2018). "Leader delle centenarie Luigina ora ha 110 anni" [Leader of the centenarians Luigina is now 110 years old]. L'Arena (in Italian). Retrieved 18 February 2019. ^ Schiano, Annamaria (13 January 2019). "È di Pescantina la più anziana del Veneto" [The oldest person in Veneto is from Pescantina]. Corriere di Verona (in Italian). Retrieved 18 February 2019. ^ "Morta a 110 anni donna più anziana del Trentino" [Oldest woman of Trentino died at 110] (in Italian). ANSA. 11 October 2016. Retrieved 18 February 2019. ^ "Addio a Iolanda, l'imolese più anziana" [Farewell to Iolanda, the elder of Imola]. Il Resto del Carlino (in Italian). 20 December 2016. Retrieved 18 February 2019. ^ Rosso, Anna (20 December 2016). "Addio alla nonna del Friuli: a 110 anni si è spenta Alba" [Farewell to Firuli's grandmother: Alba passed away at 110]. Messaggero Veneto (in Italian). Retrieved 18 February 2019. ^ Ranzanici, Luciano (15 December 2014). "Addio alla maestra della valle Lina se ne è andata a 110 anni" [Farewell to the valley's teacher: Lina is gone at 110]. Bresciaoggi (in Italian). Retrieved 18 February 2019. ^ "Oggi l'addio a Rosina Nicolli Nata a Sclemo, aveva 110 anni" [Farewell to Maria, the oldest in all of Emilia Romagna]. Trentino [it] (in Italian). 12 December 2014. Retrieved 18 February 2019. ^ Brugnoli, Franco (21 April 2015). "Addio a Maria, la più anziana di tutta l'Emilia Romagna" [Farewell to Maria, the oldest in all of Emilia Romagna]. Gazzetta di Parma (in Italian). Retrieved 18 February 2019. ^ a b Los Angeles Times. "Antonio Todde, 112; World's Oldest Man". Retrieved 6 January 2015. ^ Follain, John. "Antonio Todde, a New Record-Holder at 111, and his Daughter Angela, 76. World's Oldest Living Man Owes It All to Wine, Pasta, and Genes". Retrieved 6 January 2015. ^ Armstrong, Jane. "Oldest man lives like a king". Retrieved 6 January 2015. ^ "Europe's oldest person dies at 114". Reuters. 5 August 2011. Retrieved 12 October 2011. ^ "Nonna Emma compie 115 anni". 29 November 2014. Retrieved 26 November 2016. ^ "Venere Pizzinato, the oldest in Italy turns 113 years and refuses televisions" (in Italian). L' Arena. 23 November 2009. Retrieved 23 November 2009. ^ "Francis Joseph? He was my Emperor" (in Italian). Corriere Del Veneto. 23 November 2010. Retrieved 12 October 2011. ^ "Worcester woman is oldest living person in US". 17 May 2016. Retrieved 14 May 2017. ^ "Sixth oldest person in the world hails from Manchester". 21 January 2017. Retrieved 14 May 2017. ^ "110-Year-Old Nun's Secret To A Long Life Is Pretty Simple". 22 February 2017. Retrieved 14 May 2017. ^ "Calment11.html, No. 11 of 15; as of March 6, 2014". grg.org. 27 October 2014. Retrieved 27 February 2018. ^ "Nun from Manchester, who was world's 5th oldest person, dies at 115 years old - New Hampshire". newhampshire.com. Retrieved 7 November 2017. ^ "È morta la nonna d'Europa: Pina Projetto da Montelupo aveva 116 anni". gonews.it. 6 July 2018. Retrieved 5 December 2018. ^ "Italian nonna becomes the world's second oldest person". www.thelocal.it. 23 April 2018. Retrieved 5 December 2018. ^ "L'ultracentenaria più vecchia della Toscana risiede a Montelupo Fiorentino" (in Italian). ^ "La Maddalena. Ha 111 anni, è maddalenina, è la terza centenaria ex equo d'Italia e la più anziana della Sardegna" (in Italian). ^ "Addio a Emma, la decana del pianeta nata nell'Ottocento" (in Italian). 17 April 2017. Retrieved 10 September 2017. ^ "giuseppina-projetto-con-i-suoi-115-anni-e-110-giorni-e-la-seconda-persona-piu-longeva-ditalia" (in Italian). 17 September 2017. Retrieved 18 September 2017. This page was last edited on 26 April 2019, at 00:48 (UTC).